I’m going to follow up my rant about American Primitive painting from last week’s blog with a tribute to another such painter. It is also my tribute to African American History month. Who better to salute African Americans’ contribution to American culture than the first professional African American painter, Joshua Johnson? Needless to say, Johnson had to overcome many obstacles in the late eighteenth century to rise to the stature he did in the American art scene. While some other African American artists flourished throughout the nineteenth century, it was not until the Harlem Renaissance (c1920–1940) that African American art and culture became widely recognized and exhibited in the United States. Other than the really prominent African American artists of today such as Martin Puryear, Kara Walker, and Trenton Doyle Hancock, how many others can your students think of? Johnson was the first African American to become a professional painter and make a living from his art. Born as a slave around 1763 of a white father and black mother, Johnson was purchased by his father when about a year old. He was apprenticed to a blacksmith in Baltimore and freed in 1782. He was most likely self-taught, claiming that he had derived his style by his own keen perception of nature and art. 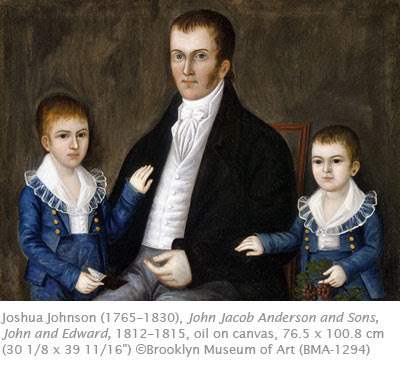 Johnson may have been influenced by the styles of Charles Willson Peale and his nephew, the Baltimore portraitist Charles Peale Polk, whose naïve style Johnson’s resembles, but there is no evidence that he ever was part of his studio. By the 1790s Johnson had a thriving portrait business. He advertised as a portrait painter in Baltimore from 1796 to 1824. John Jacob Anderson and Sons is typical of the charming facial features, naïve handling of light, space, and anatomy, and simplistic arrangement of Johnson’s compositions. Typical of naïve painters, Johnson has devoted much time to realistic detail in small aspects of the painting such as the buttons, linen collars, and fine materials. Johnson enjoyed professional success among many such prominent white families. By the 1820s, Johnson’s career began to decline, although now some eighty portraits are attributed to his hand. Art Connections: Joshua Johnson’s success as an artist against very difficult odds is just one story of African American life that can be told through art. From the 19th century Edgefield potter David Drake to contemporary abstract artist Sam Gilliam, these artists both reflect the art styles of their time, as well as contribute to the range of perspectives found in art. Learn more about a number of prominent African American artists with this image set from Davis Art Images.